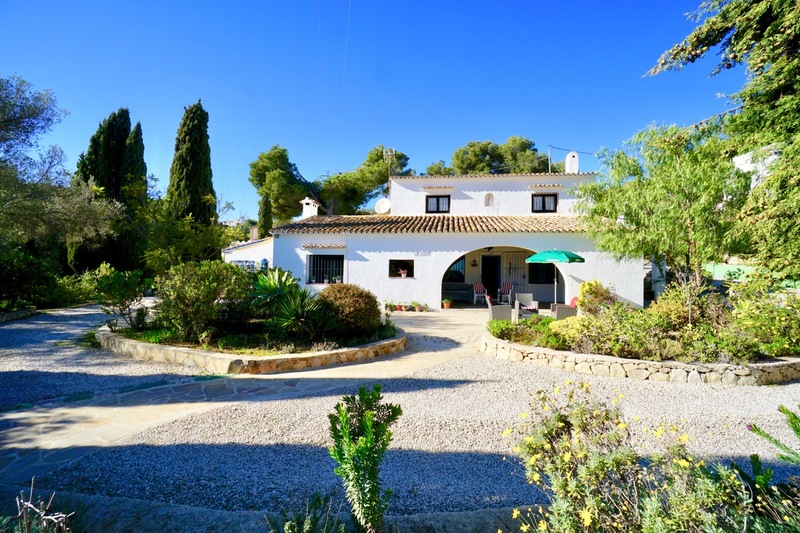 Country Finca for sale in a quiet natural setting with open country and mountain views yet only 2 km from the very town of Benissa. You enter on to the 10,599m2 plot that leads to electric double gates to the driveway and parking for up to 6 cars. The property consists of two separate living areas connected by an internal staircase. The lower accommodation has an entrance hall, open plan living/dining room, kitchen, Two bedrooms with family bathroom and a third bedroom with a private bathroom. With planning permission, there is a possibility of adding a 4th bedroom and bathroom in the under build. On this level, there are two terraces; one directly flows from the master bedroom and lounge the other has a covered roof, perfect for outdoor dining and giving magnificent views across the valley. The ground floor accommodation into a wide entrance hall leading on one side to the main bedroom and bathroom. On the other side is the Spanish style kitchen and across the hall a living/dining room with pellet fire. The lounge gives access to a South facing terrace, offering incredible views of the Mountains in the West. The main features of this property is an open covered entertaining area with a bar, offering many possibilities with an outside kitchen, dining area, dance floor, Hot tub. Steps down to the lowest section of the plot leads to the well-maintained swimming pool area with Roman steps, surrounded by a tiled terrace and partly natural grass. The pool features a jet fountain system and illuminations at night.